This is the original feast of the leader of the Heavenly armies, Saint Michael. The captain of the heavenly armies, the angel named in the Canon of the Mass, held from early times the first place in the Liturgy among the other angels; wherefore many churches dedicated to St. Michael in the Middle Ages were simply known as churches “of the holy angel.” St. Michael, whose name signifies “who is like unto God” cast the evil spirit out of Heaven, and overcame Satan in the struggle for possession of the body of Moses. God has entrusted our defense, in the combat with the devil, to the angels. The reason of this is easily understood. The devil is a spirit who has lost none of the powers inherent to his nature. In order, therefore, that the struggle should not be unequal, God has placed at our side defenders of the same nature as Lucifer, that is to say pure spirits, who are, however, greater and more powerful than he is. 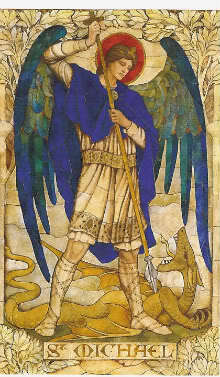 There are several feasts of St. Michael in the Liturgy. Very ancient is the commemoration of the dedication of the celebrated Lombard sanctuary on Sant’ Angelo on Monte Gargano in Apulia, near the ancient Sipontum. There is a tradition that St. Michael appeared on this mountain and requested that a church be erected to him and all the angels. In the Old and the New Testament St. Michael, in the struggle against the Evil One, is always depicted as the invincible champion of God. The mystery of iniquity which, according to St. Paul, shall be boldly revealed in the last ages of the world and which has already begun its work of perversion, meets at present with an obstacle which hinders its full development. This obstacle is usually said to be the protection of St. Michael. St. Michael is appointed by God Himself to be the protector and defender of the Church. After the protective duty conferred on St. Joseph, there is no work on earth of such great importance and sublimity as that entrusted to St. Michael. The Epistle treats the charge to St. John by an Angel to write to the seven Churches in Asia. In the Gospel Christ teaches humility, to beware of scandal, and to flee the occasions of sin, for our Guardian Angels see the face of God. O God, Who assign according to a wondrous order the duties of Angels and men, mercifully grant that our life on earth be guarded by those who continually stand in Your presence and minister to You in heaven. Through Jesus Christ, thy Son our Lord, Who liveth and reigneth with thee, in the unity of the Holy Ghost, ever one God, world without end. Lesson from the book of Revelations: In those days, God signified those things which must shortly come to pass, sending through His Angel to His servant John; who bore witness to the word of God and to the testimony of Jesus Christ, to whatever he saw. Blessed is he who reads and those who hear the words of this prophecy, and keep the things that are written therein; for the time is at hand. John to the seven churches that are in Asia: grace be to you and peace from Him Who is and Who was and Who is coming, and from the seven spirits who are before His throne, and from Jesus Christ, Who is the faithful witness, the firstborn of the dead, and the ruler of the kings of the earth. To Him Who has loved us, and washed us from our sins in His own Blood. Bless the Lord, all you His Angels, you mighty in strength, who do His bidding. V. Bless the Lord, O my soul; and, all my being, bless His holy name. Alleluia, alleluia. V. St. Michael the Archangel, defend us in battle, that we may not perish in the dreadful judgment. Alleluia. At that time, the disciples came to Jesus, saying, Who then is greatest in the kingdom of heaven? And Jesus called a little child to Him, set him in their midst, and said, Amen I say to you, unless you turn and become like little children, you will not enter into the kingdom of heaven. Whoever, therefore, humbles himself as this little child, he is the greatest in the kingdom of heaven. And whoever receives one such little child for My sake, receives Me. But whoever causes one of these little ones who believe in Me to sin, it were better for him to have a great millstone hung around his neck, and to be drowned in the depths of the sea. Woe to the world because of scandals! For it must needs be that scandals come, but woe to the man through whom scandal does come! And if your hand or your foot is an occasion of sin to you, cut it off and cast it from you! It is better for you to enter life maimed or lame, than, having two hands or two feet, to be cast into the everlasting fire. And if your eye is an occasion of sin to you, pluck it out and cast it from you! It is better for you to enter into life with one eye, than, having two eyes, to be cast into hell-fire. See that you do not despise one of these little ones; for I tell you, their Angels in heaven always behold the face of My Father in heaven. An Angel stood near the altar of the temple, having a golden censer in his hand, and there was given to him much incense; and the smoke of the perfumes ascended before God. Alleluia. We offer You sacrifices of praise, O Lord, humbly praying You to accept them graciously and to grant that they may be helpful for our salvation through the intercession of the Angels who intercede for us. Through Jesus Christ, thy Son our Lord, Who liveth and reigneth with thee, in the unity of the Holy Ghost, ever one God, world without end. R. Amen. All you Angels of the Lord, bless the Lord: sing a hymn, and exalt Him above all forever. Relying upon the intercession of blessed Michael, Your Archangel, O Lord, we humbly pray You, that what we have received by our mouth may give grace to our mind. Through Jesus Christ, thy Son our Lord, Who liveth and reigneth with thee, in the unity of the Holy Ghost, ever one God, world without end. R. Amen. To donate just press the button!